Note to Music Appreciation Monday families: I am going to be streamlining my posts for the summer by combining Music Monday and Sketch Tuesday. Look for a musical suggestion in the Sketch Tuesday posts all summer long. This is the last week of May so we will be wrapping up our Music Monday focus on John Williams. If you haven’t listened yet this month, or you would like to listen to all of the selections again, here is the link: Music Appreciation Monday – John Williams. This composer is featured in Harmony Fine Arts grade 3 plans if your family decides you enjoy listening to John Williams. Please note that I am affiliate for NotebookingPages.com and will receive a small commission if you make a purchase from them. I have used these products with my own family and highly recommend them to other homeschooling families. We have been enjoying the John Williams selection of the month: Star Wars (Main Theme). Download a free Listening Log Sheet to use with your family. 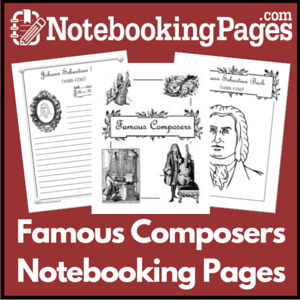 This log is not necessary but will help your older or more advanced student keep a record of composers they have listened to over a period of time. We kept adding to these pages from year to year, even up into high school. I even have my own logs!